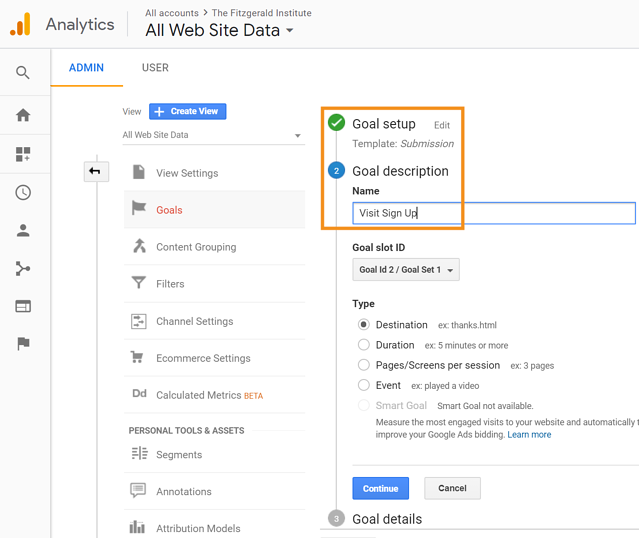 There will be a series of steps to take once in your goal set up – leverage Google’s Conversion Tracking Resource for help, or by working with a partner, like Enroll Media Group. Then, consider setting up smaller (micro) conversions as goals too – for example, a download of a viewbook, taking a virtual tour, or playing a video can be tracked, too. While these might not be the ultimate goal of your organization, they can be helpful in determining which series of smaller objectives can lead to, or assist in, accomplishing larger goals. Note, goals are not retroactive, so you must set them up before you want to start tracking them. 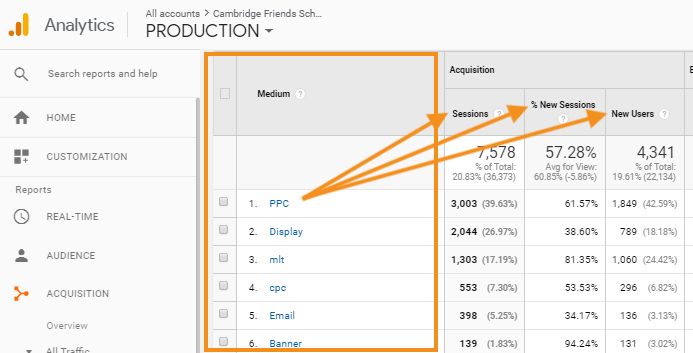 Any targeted advertising should have tracking set up in order to identify them in your GA reports and assess how they are performing more easily. Once you have determined your goal, and you launch appropriate marketing efforts to meet those enrollment goals, you will want to set up UTM tracking for digital channels like email, display or social ads. A UTM is a simple code you can attach to a custom URL to track where online traffic comes from. Let’s say you are deploying an email to your current leads encouraging them to sign up for a tour of campus. After curating your email content and a call-to-action, ensure it has a link that can click through to a landing page where the user can then sign up. This link within the call-to-action is where you will want to assign a UTM parameter. You can do so by going to the Google Analytics URL builder. Simply enter your landing page URL, and assign a source, medium, campaign, term, and content to your link. (Check out UTM best practices if you are unsure how to name your parameters). Then, when users click on the link in your email, the unique parameters are sent to your account, so you can identify the campaigns that are most effective in achieving your tour sign-ups. Once verified, developers can have a field day! Google’s Search Console has several critical Search Engine Optimization (SEO) elements that can be used to improve your rankings and overall website health. But it is also extremely helpful for marketers, admissions and other executive leaders to reference - namely through its ability to track keywords. 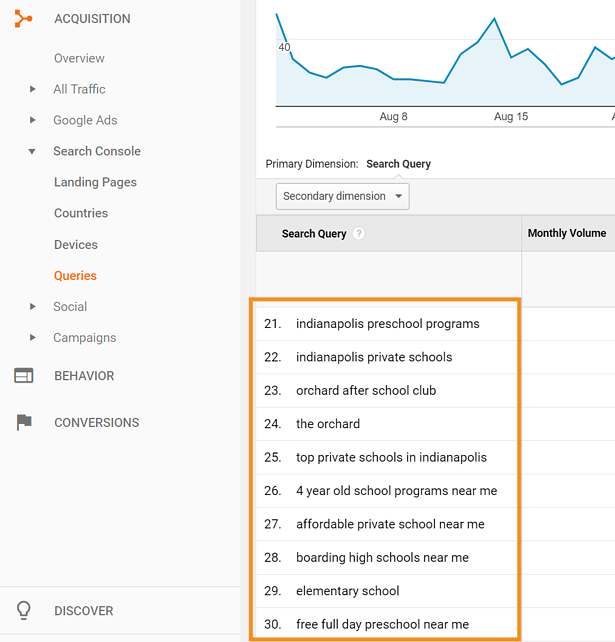 When you can identify the keywords are driving the most visibility and clicks to your website, it helps institutions understand what prospective families are actually searching for before arriving to your website via Google's Search Engine. This is a gold-mine of data for optimizing your on-page content to drive more of those qualified, free clicks. For example, if your site is ranking on page 1 for Waldorf, and page 2 for Montessori, yet those who go to your site after searching for Montessori based terms are more likely to contact you, you might want to incorporate more Montessori-related content into your website to drive more visibility and rank on that first page. You can also use these insights to steer the keywords that drive marketing campaigns. Aside from all the valuable data, Search Console is convenient too! 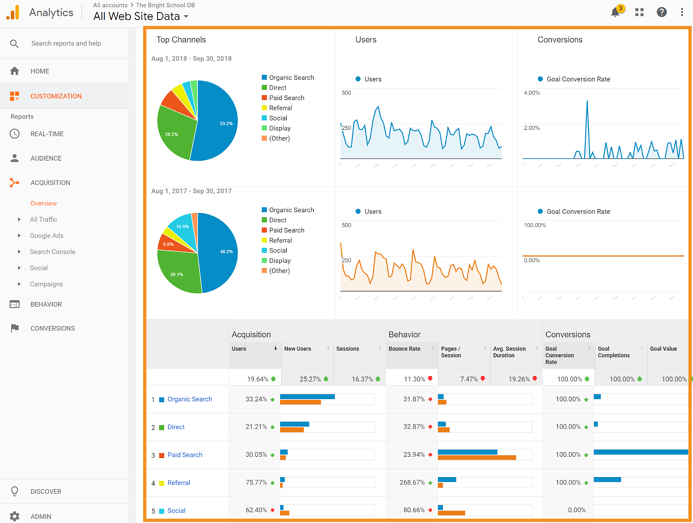 Reporting is accessible right within your Google Analytics interface, and it’s also free! Are the organization’s goals being met? What channels are (or are not) driving goals? What other opportunities exist, based on this data, to improve? The goals overview can show you if your goals are being met in a nice dashboard format. 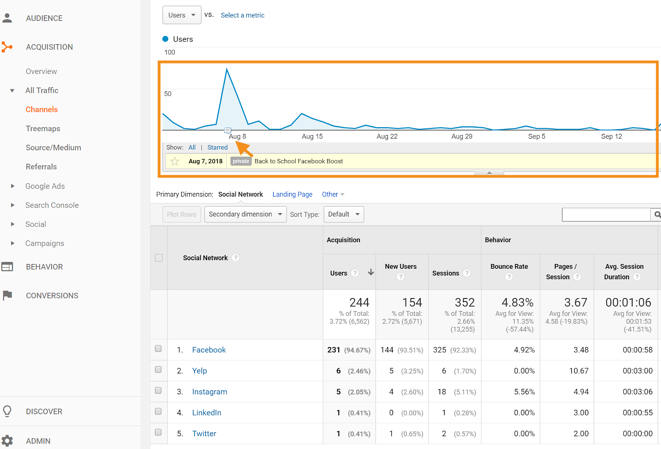 Then, the acquisition section in Google Analytics can tell you which of those channels are driving them. You can drill down on any of the UTM parameters, or by channel for a closer look. This is important because when analytics goals are set up and proper tracking is in place, you will be able to see how effective individual channels and campaigns within those channels, are at accomplishing your goals and help you determine what your return on investment (ROI) is for each of your efforts. Use these insights to shift marketing tactics around. This coupled with regular monitoring of your website activity via analytic and Search Console, will uncover opportunities that exist to optimize your website and steer content. Include them on reports to get everyone in the organization on the same page with what’s happening across teams. Annotations only take a few minutes to set up, and unlike goals, they report retroactively which means you can start to log some of your recent past events to help guide insightful reporting. Want to dive in farther? Contact Enroll Media Group’s Google certified experts who can run a custom workshop or training sessions for your team, or provide you with an analytics dashboard of your own to use. And be sure to subscribe or our updates and be notified about our upcoming webinars that focus on topics like analytics, SEO, email marketing, and digital advertising. It’s all geared towards independent schools and nonprofit organizations looking to achieve enrollment or revenue growth!